The State Parks Board, in its evaluation of the State’s resources for park purposes in the late 1950’s, recognized that the town of Jerome could more than adequately tell the exciting mining history of the State. The Board knew Jerome was unique by its very location and existing condition; it is situated in a very scenic part of the State and in a historically significant region. All of the components were present for a State Park in Jerome, and it was placed on the Board’s Ten Year Plan in 1957. M.O. 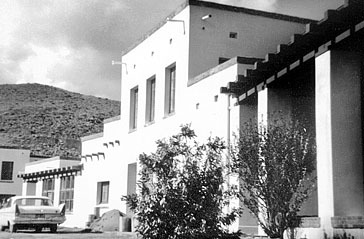 Lindner Sr., State Representative and resident of the Verde Valley, had expressed interest in the Douglas building as a state park. Lindner was a prime mover in getting the State Parks legislation passed in 1957. A feasibility study completed in 1960, made in conjunction with the National Parks Service, recommended that the Douglas Mansion would be an ideal visitor center and museum facility where the mining story of Arizona could be told and properly interpreted. Appointed to the Parks Board at its inception, and serving as Chairman in 1961, was Zeke Taylor, Verde Valley cattleman and merchant. Taylor helped in much of the preliminary work making the Park a reality. From the Douglas home, one can better appreciate the uniqueness of Jerome as it sits dramatically and precariously on the side of a hill. There is also a full view of the abandoned mining operations around Jerome and an excellent view of the Verde Valley below. In the distance, there are panoramic views of Oak Creek Canyon, Sycamore Canyon and the San Francisco Peaks. In August 27, 1962, the Parks Board concluded negotiations with Lewis Douglas and his brother, James Douglas, for the conveyance of the Douglas Mansion and 2.43 acres of land to the State for park purposes. The brothers were members of a prominent pioneering Arizona Mining family. Lewis Douglas had served as the United States Ambassador to Great Britain. His father, the legendary James S. “Rawhide” Douglas, built and occupied the magnificent home in 1916 when Jerome was a booming mining town. 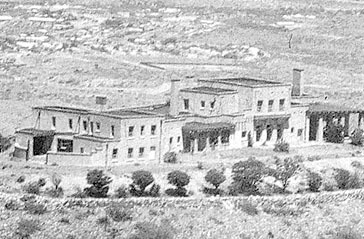 The United Verde Extension, a Douglas enterprise, was one of the big ore producers in Jerome. Phoenix Architect, Bennie M. Gonzales, was retained to oversee the first phase of remodeling and restoration. The Museum was designated as the “Douglas Memorial Mining Museum.” Three rooms on the first floor were remodeled for museum display purposes. The original dining room became the entrance lobby with public restrooms on one side and the manager’s office on the other. The living room was redesigned with a lowered circular ceiling to accommodate the displays. Sculptor, Phillip Sanderson worked with Gonzales on many of the dioramas, photos and wall murals. A parking area was constructed nearby with a picnic area immediately adjacent. On October 16, 1965, Jerome State Historic Park was dedicated and opened to the public as the fifth State Park. Guests were welcomed to the Dedication by Joseph T. Pecharich, D.D.S., Mayor of Jerome, and Fred T. Boice, Chairman of the State Parks Board. Lewis and James Douglas were the honored guest speakers at the dedication ceremony. The Opening coincided with Jerome’s annual “Spook Night” celebration, and the festivities lasted all day and into the night. When the Park opened, the admission fee was 25¢ for each adult. The Park Supervisor was Robert E. Ladd. The Douglas Mansion has been an eye-catching landmark in Jerome since 1916, when James S. Douglas built it on the hill just above his Little Daisy Mine. This former home is now a museum devoted to the history of the Jerome area and the Douglas family. The museum features photographs, artifacts and minerals in addition to a video presentation and a 3-D model of the town with its underground mines. There are more displays outside along with a picnic area offering a beautiful panoramic view of the Verde Valley.